All the stories in this anthology are inspired by HP Lovecraft. 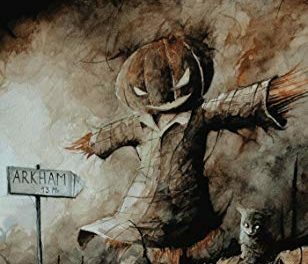 Each has its own identity but the common thread is that they are all based around Halloween, the sea, a town called Innsmouth and Lovecraft himself. 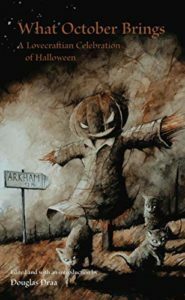 The book opens with the poem Hallowe’en in a Suburb by Lovecraft and this sets the tone for this haunting collection of stories. Many of the stories are dark and worrisome and all have the qualities of good scary stories that should be repeated at campfires, sleepovers or just because you can. Indeed, you may find yourself recounting Darrell Schweitzer’s Uncle’s in the Treetops. A tale of the town of Chorazin and it’s belief that their ancestors in the sky will come and pick a chosen one from two possible brothers. Joram is young and innocent and Thomas is older and full of hate for his sibling. The lengths that Thomas will go to in order to become chosen are frightening. Or, Down into the Silence by Storm Constantine. Once again Innsmouth is the setting for a photographer who is documenting the history of the town. He meets an ethereal woman who may or may not be real. By far my favorite two stories of the whole book were : That Small Furry Sharp-toothed Thing by Paul Dale Anderson and No Other God But Me by Adrian Cole. Anderson’s tale is one of psychological horror and the testing of a man’s belief. John is an educated man, he’s read Lovecraft’s Necronomicon and belives in the mythos. So when Lovecraft’s character Brown Jenkin becomes the latest Halloween costume craze, he is against the idea of his children wearing it. John believes that they will become pawns for Cthulhu and so will the rest of the town’s children who already own the costume. He refuses the pleas of his children and despite his wife’s protestations at his stubbornness, he won’t allow his children to wear the Brown Jenkin costumes. He is then plagued with fever dreams of his children coming to harm and imagines tiny creatures crawling in the walls. Seeing that his mental health is deteriorating his wife suggests he sees a shrink. The sleeping pills he’s given cause him to sleep through two days until he eventually wakes up on All Hallows Eve. Is he too late to save his children from Cthulhu? Conversely, Adrian Cole’s No Other God But Me is a story based on witchcraft and the power of nature. Following the death of the local Vicar, residents of the seaside village Rooksands become suspicious of the circumstances. Their fears are only enforced when the death toll rises, people are lost at sea and falling from cliffs, their bodies claimed by the sea. Not to mention the man-sized squid-like creature that a fisherman pulled from the sea. Realising that their Christian beliefs are no defense against the sea or the creatures within it, the residents look for another source of help in the form of Morgana a witch. Telling them to carve sigils of protection on their doors and plant pumpkins that are fertilized with blood and bone, the residents follow Morgana’s advice. Samhain is coming and Morgana believes this will be when the sea and the creatures in it will try to pull the town of Rooksands into a watery abyss. I greatly enjoyed all seventeen of the stories in this book and wish that I could praise each one for they each have their own merits. All the authors have brought their own take on Halloween and their inspiration they get from Lovecraft can be clearly seen. Suffice it to say that this book is a good read whether it is Halloween or not.